GBP£1Makes a difference and every £1 adds up! GBP£25Gets us well on the way to our target. A fund inspired by HOPE. 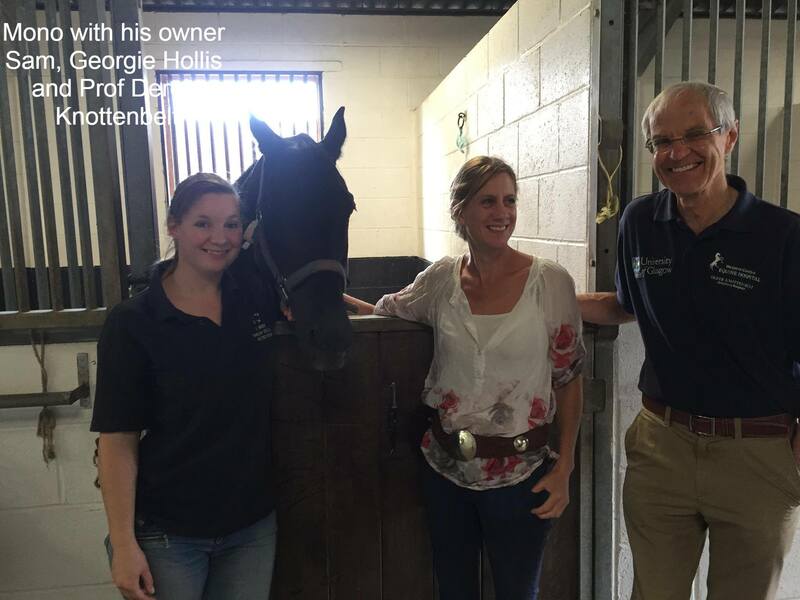 Pictured: Mono and his owner Sam Hope accompanied by Georgie Hollis and Professor Derek Knottenbelt who performed and taught Sam's Vets how to graft by using Mono's wounds. Domino: Our second candidate for the fund being Domino. His story being another case of a very difficult situation for both owner and clinicians. Despite the very best of care Domino was left with a non healing wound to his face that required specialist surgery to resolve. Wounds of this type are unusual and very difficult to manage. 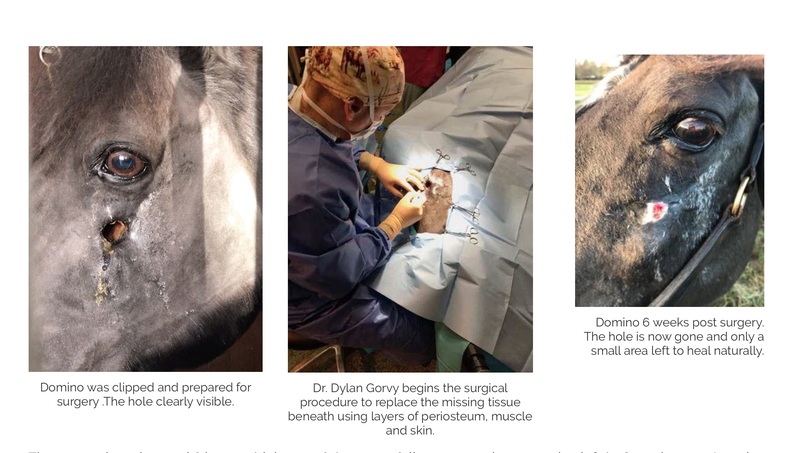 Dr. Dylan Gorvy travelled from Sweden to perform a carefully planned procedure within Domino's own veterinary practice. In 6 weeks from surgery and 18 months after the original incident that caused the wound, Domino is close to healed. 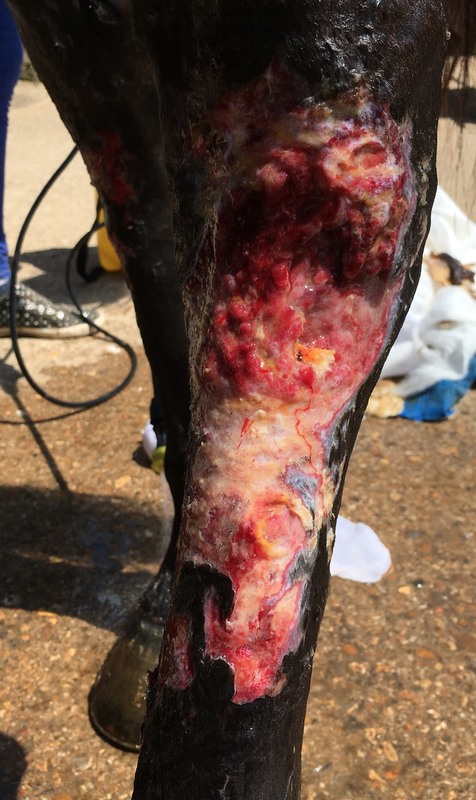 In Mono's case Georgie Hollis (founder of the Vet Wound Library) proposed that Mono may need skin grafts to achieve the best outcome based on the 3 aims of wound management. Having seen similar scenarios in practice Georgie suggested that with the support of Professor Derek Knottenbelt that Mono could have surgery as an educational procedure for the practice to learn how to skin grafting. By using Mono as an educational opportunity for the practice and with Sam's consent we arranged for the legendary Derek Knottenbelt to attend and teach. Ongoing support was provided by the Veterinary Wound Library. Not only did the practice gain new expertise that would be of benefit to future patients but Mono and Sam got the surgery that was needed at cost. We (The Vet Wound Library) see cases like this frequently. Insurance may not cover the cost of management of the most challenging wounds and despite owners best efforts costs can rise fast and specialist help may be limited. Grafting and reconstruction are techniques that we believe can transform the healing process from one that can take years to just weeks. The hope fund aims to enable clinicians to provide the best possible outcome for their case when all other options have been exhausted. By supporting cases like this we hope to teach more practices advanced skills that may offer hope to patients and owners and patients. Your Support: Our fund is intended to help cases like Mono. Where despite best efforts specialist help is required. All the cases we support are overseen and managed as part of the Veterinary Wound Library specialist support service and can be accessed by practices who are members of the Vet Wound Library. The cases we support will be filmed or documented for educational purposes in lieu of the financial support we provide. The Hope Fund is part of the Veterinary Wound Library. The fund is ring fenced and of charitable purpose. Your donation will only be used to assist patients that will benefit from specialist support, techniques or equipment that would otherwise be inaccessible. You were absolutely fantastic with Binx earlier this year and you provide a very valuable service. Thank you!